*Job and Gertrud Tamaki Professor, The Henry M. Jackson School of International Studies; Adjunct Professor, School of Law; and Founding Co-Director, Space Policy and Research Center (SPARC), University of Washington, Seattle. I thank the Center for Global Partnership (CGP) for financial support. I also thank all the participants at the symposium for their helpful comments, especially Matthew Stubbs, Bill Covington, Pat Kuszler, Kelli Hooke, and Dongsheng Zhang. 1 Walter A. McDougall, …the Heavens and the Earth: A Political History of the Space Age (1985); Asif A. Siddiqi, Challenge to Apollo: The Soviet Union and the Space Race, 1945–1974 (2000). 2 Dave Baiocchi & William Wesler IV, The Democratization of Space, 94 Foreign Aff. 98 (2015). 3 David A. Lake, The State and International Relations, in The Oxford Handbook of International Relations 41–61 (Christian Reus-Smit & Duncan Snidal eds., 2008). 4 See Saadia M. Pekkanen & Paul Kallender-Umezu, In Defense of Japan: From the Market to the Military in Space Policy (2010); James Clay Moltz, Asia's Space Race: National Motivations, Regional Rivalries, and International Risks (2012); Deganit Paikowsky, The Power of the Space Club (2017). 5 See Welcome to the Australian Space Agency, Australian Space Agency (Sept. 2018); Burak Ege Bekdil, Turkey Moves to Launch Space Agency, Def. News (Mar. 2, 2017); Overview, South African National Space Agency. 6 See About the Israel Space Agency, Israel Space Agency. 7 See Gov't of Luxembourg, Space Resources: Exploring New Frontiers. 8 UAE Announces First Astronauts to Go to Space, Phys.org (Sept. 3, 2018). 9 Saadia M. Pekkanen, China's Ambitions Fly High: ‘One Belt, One Road’ to Extend into Space, Forbes (May 26, 2017). 10 J.I. Gabrynowicz, The “Province” and “Heritage” of Mankind Reconsidered: A New Beginning, in Lunar Bases & Space Activities of the 21st Century (W.W. Mendell ed., 1988). 11 Global Space Governance: An International Study 113–18 (Ram S. Jakhu & Joseph N. Pelton eds., 2017). 12 Jeff Foust, A Trillion-Dollar Space Industry Will Require New Markets, Spacenews (July 5, 2018). 13 China Launches Rocket Developed by Private Company, Xinhua (May 17, 2018). 14 Blaine Curcio & Tianyi Lan, Analysis: The Rise of China's Private Space Industry, Spacenews (May 25, 2018). 15 Interstellar Technology's Second Rocket Crashes Seconds After Liftoff in Hokkaido, Japan Times (June 30, 2018). 16 Canon and IHI Planning Japan's First Private-Sector Rocket Launch Site, Nikkei Asian Rev. (Jan. 27, 2018). 17 Debra Werner, Small Satellites Are at the Center of a Space Industry Transformation, Spacenews (Aug. 22, 2018). 18 Caleb Henry, FCC Approves SpaceX, Telesat, LeoSat and Kepler Internet Constellations, Spacenews (Nov. 15, 2018). 19 Aaron Gregg, Defense Giants Bet Big on Small Satellites, Wash. post (Sept. 16, 2018). 20 Jeff Foust, Deep Space Industries Acquired by Bradford Space, Spacenews (Jan. 2, 2019). 21 Alan Boyle, Japan's ispace Strikes Deal with SpaceX for Launches to the Moon in 2020 and 2021, GeekWire (Sept. 26, 2018). 22 See SpaceX, Nusantara Satu Mission. 23 Guinness Awards Title to Hayabusa Probe, Japan Times (June 14, 2011). 24 JAXA Says Landing-Site Selection for Hayabusa2's Touchdown on Ryugu Asteroid Is in the Final Stage, Japan Times (Jan. 6, 2019). 25 Saki Hayashi, Japan-India ‘Space Dialogue’ to Include Surveillance Sharing, Nikkei Asian Rev. (Dec. 9, 2018). 26 Kenneth Chang, NASA Chooses Private Companies for Future Moon Landings, N.Y. Times (Nov. 29, 2018). 27 China's Chang'e-4 Probe Makes Historic Landing on Moon's Far Side, Xinhuanet (Jan. 3, 2019). 28 Sandra Erwin, Space Industry Hit Hard by Military Spending Downturn, Spacenews (Jan. 22, 2018). 29 Sandra Erwin, Boeing, Lockheed, ULA Corner the Government-Funded Space Market. SpaceX Moving Up, Spacenews (Jan. 22, 2018). 30 Joseph Ax, SpaceX Launches First U.S. National Security Mission, Reuters (Dec. 23, 2018). 31 Alan Boyle, Blue Origin, Northrop Grumman and ULA Win Air Force's Backing for Future Rockets, GeekWire (Oct. 10, 2018). 32 Jeff Foust, Rocket Lab to Launch DARPA Satellite, Spacenews (Jan. 22, 2019). 33 Werner, supra note 17. 34 Pat Host, DARPA Awards Contracts for Blackjack Small Satellite Programme, Jane's Def. Wkly. (Jan. 16, 2019). 35 Stephen M. Walt, What Sort of World Are We Headed For?, Foreign Pol'y (Oct. 10, 2018). 36 Joan Johnson-Freese, Space Warfare in the 21st Century: Arming the Heavens (2017). 37 Laura Grego, A History of Anti-Satellite Programs (2012). 38 Mary Beth Griggs, Trump's Space Force Aims to Create ‘American Dominance in Space’ by 2020, Popular Sci. (Aug. 9, 2018). 39 Fabio Trronchetti, Legal Aspects of the Military Uses of Outer Space, in Handbook of Space Law 333–34 (Frans von der Dunk & Fabio Tronchetti eds., 2015). 40 See Agora: The End of Treaties, 108 AJIL Unbound 30 (2014). 41 See Symposium on Treaty Exit at the Interface of Domestic and International Law, 111 AJIL Unbound 425 (2017). 42 Francis Lyall and Paul B. Larsen, Space Law: A Treatise 27–48 (2018). 43 Pitman B. Potter, International Law of Outer Space, 52 AJIL 305, 306 (1958). 44 Saadia M. Pekkanen, Agents of Design, in Asian Designs: Governance in the Contemporary World Order 1 (Saadia M. Pekkanen ed., 2016). 45 Tanja Masson-Zwaan, New States in Space, 113 AJIL Unbound 98 (2019). 46 Setsuko Aoki, Domestic Legal Conditions for Space Activities in Asia, 113 AJIL Unbound 103 (2019). 47 Paul B. Larsen, Commercial Operator Liability in the New Space Era, 113 AJIL Unbound 109 (2019). 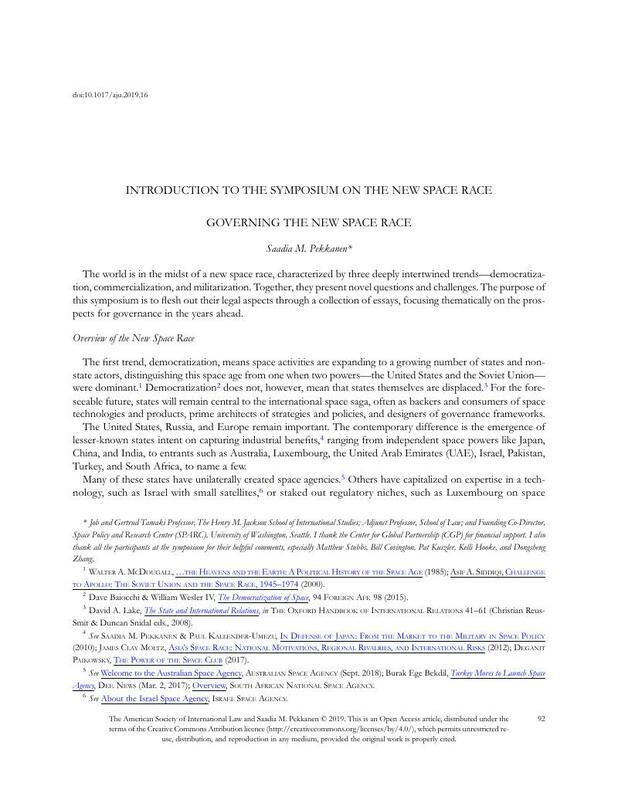 48 Brian R. Israel, Space Resources in the Evolutionary Course of Space Lawmaking, 113 AJIL Unbound 114 (2019). 49 P.J. Blount, Space Traffic Management: Standardizing On-Orbit Behavior, 113 AJIL Unbound 120 (2019). 50 Matthew T. King & Laurie R. Blank, International Law and Security in Outer Space: Now and Tomorrow, 113 AJIL Unbound 125 (2019). 51 Myres S. McDougal & Leon Lipson, Perspectives for a Law of Outer Space, 52 AJIL 429, 429–30 (1958). 52 Pekkanen, supra note 44, at 11–16, 227–42.